The name Cartier is synonymous with jewelry and magnificence. Cartier is a French family-owned jewelry company, founded in 1874. The company was founded and continues to be headquartered in Paris. Cartier has a long history of designing and providing pieces to royalty and celebrities. They have been referred to as “Jeweler to Kings, King of Jewelers.” In fact, Cartier was commissioned to create the tiaras and crowns for numerous courts including Spain, Greece, Egypt, Russia, and Portugal, among others. Cartier was first known for watches. In fact, the company created the first “practical wristwatch” in 1904 called the Santos. This was due to a watch designed for Alberto Sanos-Dumont, a Brazilian pilot and friend of Cartier. The pilot criticized the reliability of pocket watches while in the air. In response, Cartier created a flat watch with a strap to be worn on the wrist. The watch had a square bezel, which became Cartier’s distinctive design. Thus, Cartier goes down in history as creating the first men’s wristwatch. One of the ways Cartier defined themselves as a jeweler was to use platinum settings for diamonds. The company pioneered platinum setting. Cartier wedding bands & rings are high-quality, platinum pieces. Platinum is whiter than even white gold, which has met the public’s need for white diamonds. Platinum settings create an entirely white look for the diamond, which plays off of the inherent Louis XVI style of Cartier. Platinum is a more pure metal than gold. Additionally, it is hardier and sturdier than white gold and keeps it shape and color longer. Platinum is also a much heavier metal. Thus, slipping on a platinum ring onto your finger creates a greater sense of wearing a substantial piece of jewelry than gold or silver. Cartier resisted the temptation to design trendy jewelry and instead maintained a traditional, classic style. Cartier wedding bands & rings are timeless pieces that will still be garnering compliments decades after the “I dos” have been said. Cartier is tantamount to superb design. The famous Hope diamond, now on display at the Smithsonian Museum, was mounted and set by Cartier. Designs by Cartier are unique and distinctive. Many couples opt to choose a Cartier diamond and have it set by Cartier jewelers. Rose gold entered the jewelry scene nearly a century ago. It is making strides on the current bridal jewelry scene. Also, known as “pink gold,” this rose-tinged metal seems more striking and mysterious, but its hue is due to the amount of copper mixed with the gold. Gold rings are never pure gold due to the inherent softness of the metal. Cartier offers a number of pink, gold wedding bands. There are downright pink, gold wedding bands, as well as bands with gemstones and diamonds. Because of Cartier’s stellar reputation and quality, Cartier wedding bands & rings are more expensive than purchasing from another company. All Cartier rings are engraved with the word “Cartier” inside the band as well as a serial number. An 18 carat gold 2.5 milimeter wedding band will run $400. Comparable size and carat bands will cost roughly half that amount. A bride or groom seeking an 18 carat yellow gold Cartier wedding band with channel set diamonds can expect to lay down $4000. A comparable 18 carat band with channel set diamonds from a less reputable jeweler can run less than one thousand dollars to just over a thousand dollars. 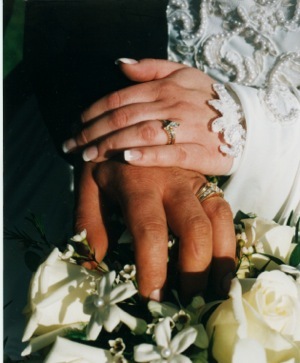 White gold 5mm channel set Cartier wedding bands & rings will cost a groom more than $11,000. A non-Cartier comparable band will set the purchaser back less than two thousand dollars. A 2.5 millimeter Cartier wedding band, made from platinum, costs $1,350. A comparable platinum band will run $450 or so. An 18 carat 2.5mm pink, gold Cartier wedding band is $425. Non-Cartier 18 carat 2.5 milimeter pink, gold wedding bands can be purchased for less than one hundred dollars. The use of precious gems in wedding bands is a new trend. A semi-paved Cartier wedding band with white gold, diamonds, and sapphires, costs about $2,700. A non-Cartier replica will run less than $600. A wedding band with brilliant-cut diamonds encircling a platinum band by Cartier will cost more than $7000. 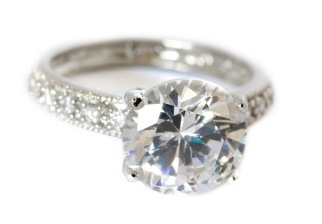 A comparable ring by a less known jeweler will cost less than a quarter of that price. Cartier wedding bands & rings are an investment in something larger than a piece of jewelry. Couples who opt for the signature red Cartier box are announcing faith in the union of the marriage itself. Where to Buy Cartier Wedding Bands & Rings? If the purchaser is not located near a brick and mortar Cartier store, Cartier wedding bands & rings can be procured online at Cartier.com. Used Cartier wedding bands & rings can be purchased on resell websites, such as eBay, GoAntiques, and eCrater. Used Cartier pieces are sold for well below the original retail price of Cartier wedding bands & rings. These pieces can be verified as genuine Cartier pieces by the engraving of the name within the band and the signature red box sporting “Cartier”, as well. There is also the serial number, which proves the authenticity. The Cartier Love Wedding Band is a signature piece. Cartier explains their inspiration is from a series of bracelets from the 1970s, which could only be opened with a tiny screwdriver. The Love Wedding Band comes in pink gold, white gold, and platinum. The bands come with circles with a line down the center or set with diamonds. The Cartier yellow gold Love Wedding Band with no diamonds is $800. The Cartier yellow gold Love Wedding Band with a single diamond is $1550. The Cartier yellow gold Love Wedding Band with diamonds all around costs $2825. The Cartier yellow gold Love Wedding Band with no center diamonds, but a tiny dusting around the embossed circles is $5825. The white gold version with no diamonds will run just under one thousand dollars. The white gold Cartier Love Wedding Band with a single diamond costs $1675. The white gold Cartier Love Wedding Band with diamonds all around the band runs $3,000. The Cartier Love Wedding Band made of white gold with center set diamonds and a tiny crusting of diamonds all around the band itself will cost the groom nearly $13,000. The Cartier pink, gold Love Wedding Band with no diamonds is $800. The Cartier pink, gold Love Wedding Band, with a single diamond, is $1,550. The Cartier pink, gold Love Wedding Band with diamonds set all around the band is $2,825. The Cartier pink, gold Love Wedding Band a frosting of tiny diamonds to accent the band is $5,825. The Cartier platinum Love Wedding Band absent any diamonds will cost $2000. It is not offered with diamonds. Intertwined pink, yellow, and white gold create a celebrated symbol of fidelity, friendship, and love. The word “Cartier” is readily visible on the top of this stunning creation. The retail price is not available on the website. The price is only available by request. A simply click on the website will direct the visitor to a form allowing the request of the price and any other pertinent information regarding the Cartier Trinity Ring. One of the benefits of Cartier wedding bands & rings is that the pieces can be easily re-sized. Platinum lends itself to resizing nicely—even more so than gold. The best way to ensure proper ring size and fit it to step into a brick and mortar store and let the jeweler utilize the metal rings to find proper size. If ordering online is preferable, Cartier offers several methods for determining proper sizing for their rings on their website. If the ring were to arrive incorrectly sized for the recipient’s finger, Cartier will gladly accept a return. They will then provide a properly sized Cartier wedding band & ring. Cartier wedding bands & rings are a beautiful, elegant way to celebrate the love within a couple.